From Left to Right: Transparent Marble White, Titanium White, Ultramarine Blue Deep, Veridian Green, Asphaltum, and Alizarin Crimson. Last week, I acquired a sample shipment of some oil paints from the Jack Richeson company based out of Kimberly, Wisconsin. These samples came to me courtesy of Lakeshore Art Supplies, LLC in Sheboygan, WI. The first 1/3 of these tubes were solid and had to be pulled out with a piers. The remaining paint is extremely thick and difficult to squeeze from the tube. Unfortunately, two of the colors I had ordered 6 years ago arrived nearly solidified in the tube- and as it happened they were the most expensive colors I had ordered- cadmium red pale, and cobalt violet light. I could chalk this up to the fact that I ordered them from Blick in the middle of the summer, and who knows how long the paints sat in their warehouse or distribution center before I came along. 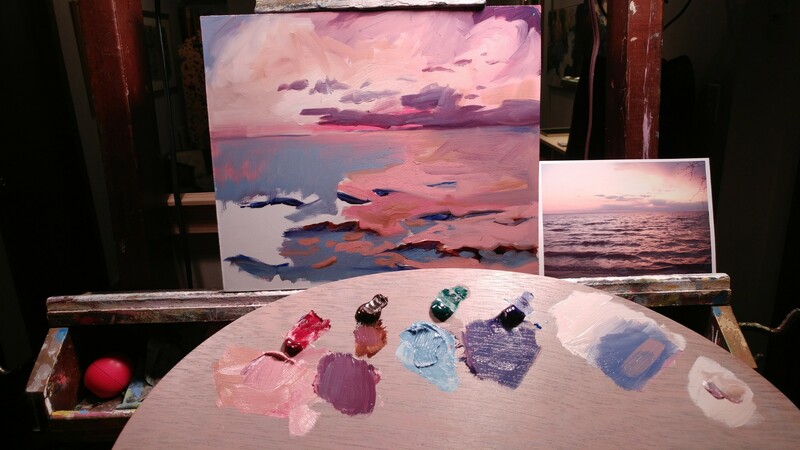 Regardless, this was the farthest consideration on my mind when, in the middle of painting outdoors, I would have to find some level ground to set my palette and paint tubes down and literally step on them with all the weight of my full figure to get any worthwhile paint to come out. This put a damper on my enthusiasm for this brand of paint manufactured in my own state, a mere 70 miles from my home. I really wanted to love them. But alas, I took to Gamblin, Holbein, and Williamsburg instead. Richeson Oils use a blend of Linseed and Safflower oil to carry the pigment load. The inclusion of Safflower oil likely reduces the amount of yellowing that linseed oil has been known to cause as paintings age. This selection that I have before me today is beautiful. Super fresh and directly shipped from the plant, I had absolutely no oil separation when squeezing the first blobs onto my palette. I was curious about the asphaltum and the transparent Marble White, since I’ve never used those colors before. I was surprised at the range of colors I ended up mixing from this limited palette of pigment. The asphaltum is a beautiful transparent brown that, when mixed with white, makes a nice yellowish beige. On its own I wouldn’t have suspected it to work so well in sunset imagery, but when accompanied with the coolness of the crimson and the violets and blue-greens in the composition, it worked quite well. As for the consistency of the paint, it is everything I have come to expect from good quality oil paints. The pigments are ground very fine. None of the colors were gritty. The only tube I took some issue with was the Titanium White. I noticed right away that it was very soft. When mixing, the tinting strength was considerably weaker than what I experienced from other brands. One look at the back of the tube and sure enough, it’s a blend of PW4 (zinc) and PW6 (titanium). So, the label is misleading in this case. It does make a nice mixing white but it would be nice if the labeling reflected the blend. 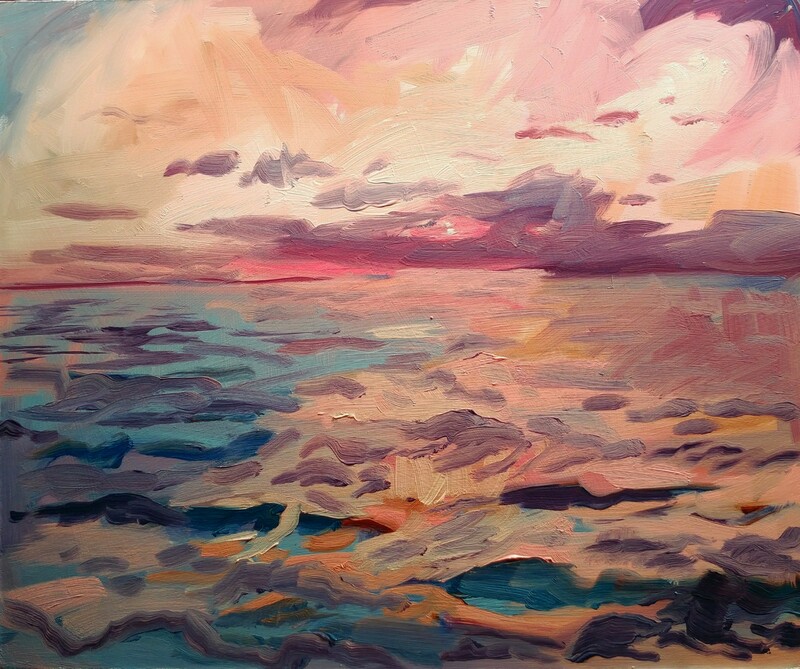 As for the transparent marble white, I’m not sure what other painters use it for but I enjoyed using it as an extender to pick up remnants of color from my palette, instead of having to mix more of that color for small touch-ups. I also like mixing it with my medium to thicken it out just a little bit. Maybe it is nice for glazing techniques. At any rate, overall, I would consider buying this brand once again based on my experience with this batch of paints. Having recently toured the plant last November, my desire to support this local company recently grew stronger. 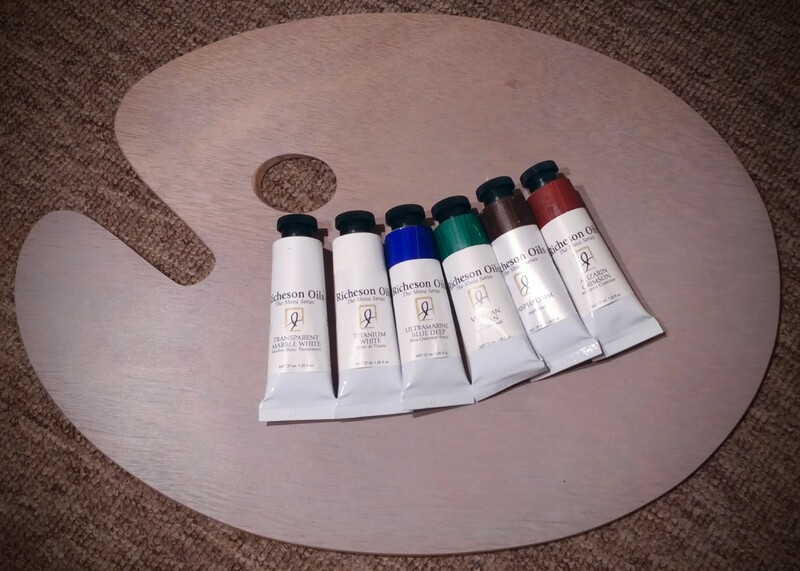 They make many great quality Artist’s materials right at the plant- easels, taborets, cradled panels, palettes, canvas stretchers, drawing pads- and are one of few U.S. suppliers of Unison Pastels, which are probably one of the best quality pastel lines in the world. This sample batch of oils gave me the hope I was looking for, that maybe my order from 6 years ago was a complete fluke and that I can go back to trusting these oil paints made right in my home state. 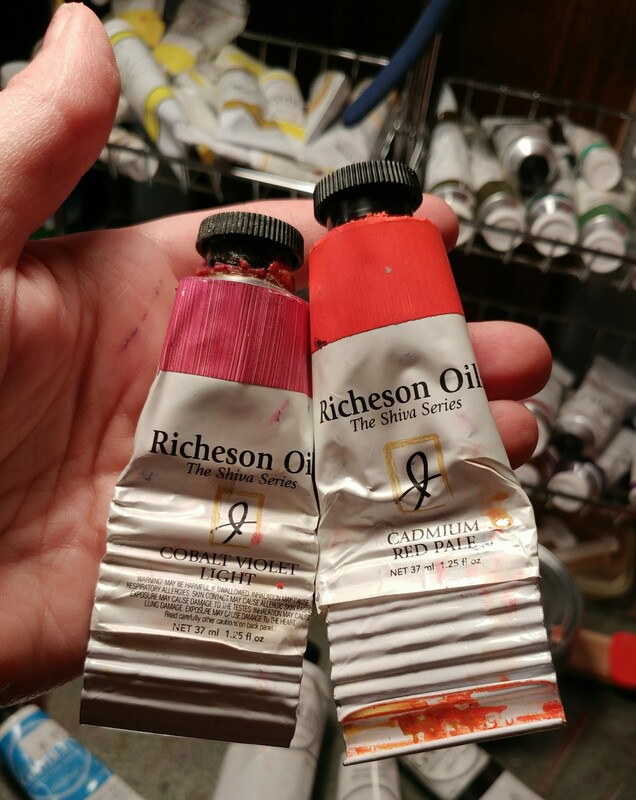 If you are looking for traditional Artist’s oil colors at a reasonable price, Richeson is worth a try. I am not being paid to say this. What are your preferred brands of art materials? I’d love to hear all about them!